The U.S. Mid-Century Strategy for Deep Decarbonization, released in November 2016, calls for the United States to reduce economy-wide greenhouse gas emissions 80% by 2050. A significant portion of those reductions are to come from the forestry and agricultural sectors. Those reductions will be more difficult and more expensive to achieve if the current U.S. forest sink is not maintained and the greenhouse gas impacts of agriculture are not addressed. 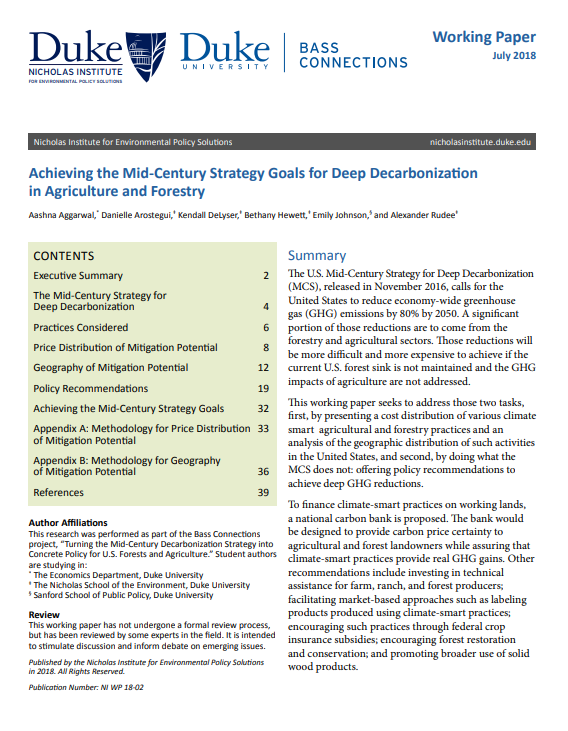 This working paper seeks to address those two tasks, first, by presenting a cost distribution of various climate-smart agricultural and forestry practices and an analysis of the geographic distribution of such activities in the United States, and second, by doing what the Mid-Century Strategy for Deep Decarbonizationdoes not: offering policy recommendations to achieve deep greenhouse gas reductions. To finance climate-smart practices on working lands, a national carbon bank is proposed. The bank would be designed to provide carbon price certainty to agricultural and forest landowners while assuring that climate-smart practices provide real greenhouse gas gains. Other recommendations include investing in technical assistance for farm, ranch, and forest producers; facilitating market-based approaches such as labeling products produced using climate-smart practices; encouraging such practices through federal crop insurance subsidies; encouraging forest restoration and conservation; and promoting broader use of solid wood products. It is the product of a Duke University Bass Connections Project.